Get the most from your Slovenian travels with this day trip to Bled and Postojna from Ljubljana. Enjoy personal attention from your guide on this small-group tour, and visit must-see sights such as the Postojna Cave, Lake Bled, and Predjama castle. Get picked up at your Ljubljana hotel around 8:30am, and be ready for your 11-hour journey through Slovenia. Please note you’ll do about six miles (10 km) of walking throughout the day, so this day trip is not recommended for those who have a hard time walking or standing for a long period of time. After about a 45-minute ride from your hotel, reach the gorgeous Bled Lake. Head up to Bled Castle, which is at the top of a steep cliff overlooking the lake. Snap some pictures while you’re at one of the best spots for photos of the lake. As you head back down from the castle, take a ride in a traditional covered boat made by locals to an island of Slovenia (own expense). On the island, climb up 99 stairs as you make your way to a 15th-century church where you can actually take turns ringing the bell in the bell tower. Next up is Postojna Cave. Take a 1.5-hour tour of the karst cave, including an electrical train ride and a walk through the stalactite paradise before going to Predjama. In Predjama, step inside its fairytale-like castle to explore its rooms and corridors. The outside of the castle is built within the mouth of a cave—so it’s also a great place to take photographs. We had a very nice time on this trip. We felt like we had the right amount of time at each place. It was great to see 3 different places without it feeling like a rushed or really long day. I recommend all 3 attractions Lake Bled, Postojna Caves and Predjama Castle. It was also nice to be in a small group. This tour and another I took to the Karst region (Skocjan) and coast were through Roundabout and were the best money I spent in my 2 weeks in Europe. Both tours are great Slovenian samplers showcasing its extraordinary variety. Small group - no more than 8 - makes it really personalized. Great guide! Brilliant tour and a must to do! Got to see quite a bit of Slovenia on this trip. Lake Bled is really beautiful and the caves at Postojna were amazing. The tour was a lot of fun, small group so everyone got familiar with each other. In addition to Bled and Postojna we stopped for about an hour and hiked through Vintgar gorge and later visited Predjama Castle which is about 700 years old. Tour guides were very informative and friendly. Thanks to guide Tjasha especially for keeping me company on the drive from Bled to Postojna. A very interesting and enjoyable trip. Lake Bled was beautiful, Predjama Castle an awesome sight and Postojna Caves very interesting. Our guide Darja was very pleasant, informative and helpful. She also spoke excellent English. Would highly recommend. 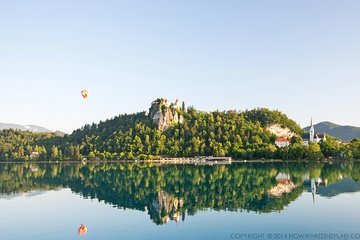 Just be aware that if you decide to take the boat trip to the island in the centre of Lake Bled it is quite expensive at 14 Euro for the return trip and they cram 22 people onto a small boat. The cave was the absolute highlight. The guide was well-informed and I thought it was money well spent. Kudos. A great tour all-around with a tour guide who was knowledgeable, chill, and relaxed which made the entire trip seem un-rushed. Great trip to see a day's worth of highlights there's really four distinct visits here when you include the waterfalls/gorge and the castle. You cover around 10km on foot over the day, so don't attempt this if struggling with mobility. Our guide Tanya did great too. One criticism - Slovenian law prevents the use of head-mics for the audio commentary. But that should not mean the guides drive one handed either. It's NOT safe. We visited Vintagar gorge, Bled, Postojna and Predjama castle in one day as we were only for a day in Ljubljana. Our guide Sanjin from Roundabout Travel was very knowlegeable and he made our visit memorable.